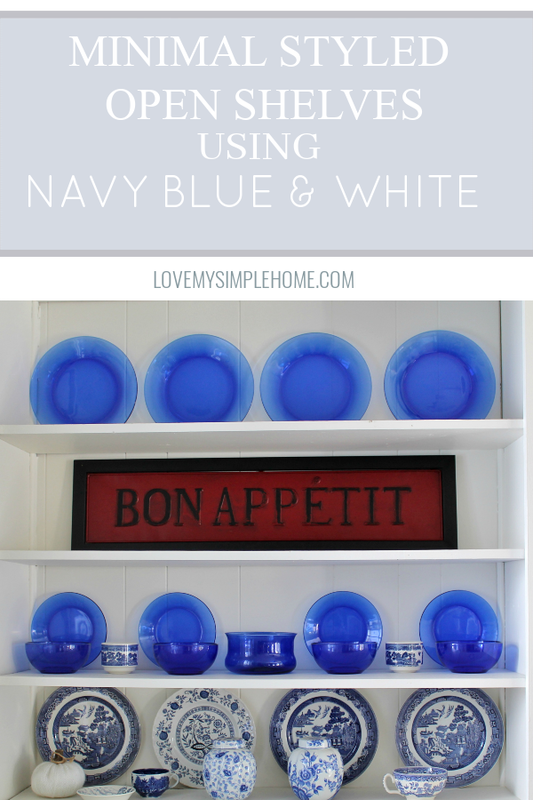 This summer I took a minimal approach decorating the shelves in our dining room by using a unified color palette of navy blue and white. Every so often I'll strip the shelves down and start over using only what I love. I placed a few pieces from my collection of transferware on the lower shelf and hung the rest of the plates on the wall. 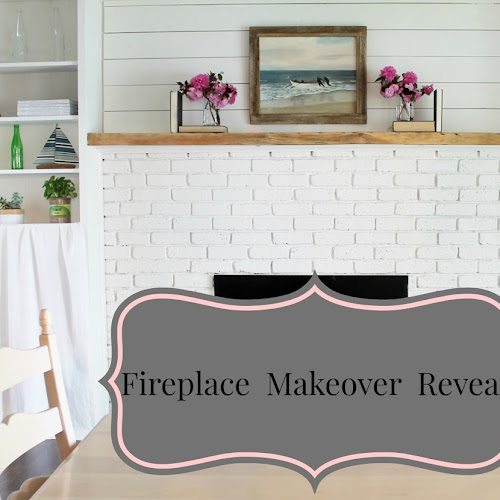 This fall I plan on making some design changes in our home so over the summer I sold some of the small furniture pieces and dishware that no longer fit my style. It felt really good to let go of the things that were taking up space in my home and holding me back from making future design changes. I kept my favorite dishware and displayed the pieces on the shelves. I gave each piece plenty of breathing room and kept the color palette unified using my favorite color blue. I know minimal decorating isn't for everyone, some might call it cold and boring, but when decorating open shelves the less is more approach is best. I decorated the shelves in the simplest way with few elements to create a maximum effect for the minimally styled shelves above. I placed four plates in a row and placed a matching bowl in front of each plate. The round plates and bowls give interest to the clean lines of the white shelves. On the lower shelf, the ginger jars and a single blue and white plate act as art for interest. 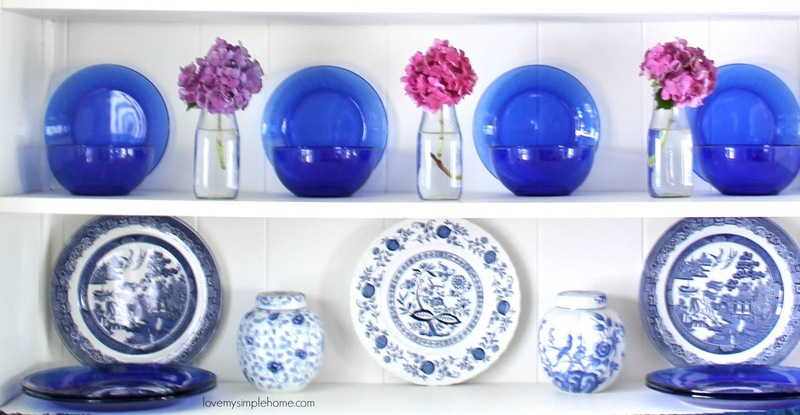 You could leave the shelves as is or add more color and interest like I did below with a pop of pink from the flowers and two more plates with more blue than white. Notice how I kept the bottles clear, otherwise, the design will be too busy. I replaced the gray curtain with a navy blue one to hide the clutter that accumulates in this area. The baskets are also great to store those extra plates and decorating accessories for when you want minimally styled shelves. I use baskets on the shelves to keep things organized and hidden away. Below is a picture of my shelves styled for fall from last year and Simple Solutions To Hide Clutter using curtains and baskets. I hope I've given you some decorating ideas on how to minimally style open shelves. 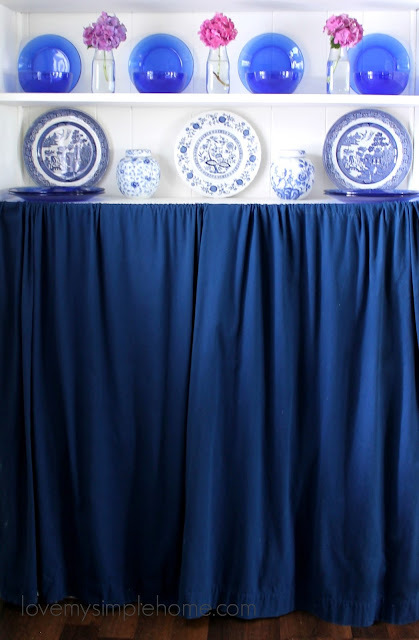 Soon it will be fall and I can't wait to show you how I'm using navy blue and white in my fall decor.